All 11 French presidential candidates have made their final pitches in the last set-piece TV encounter ahead of Sunday's first round of voting. 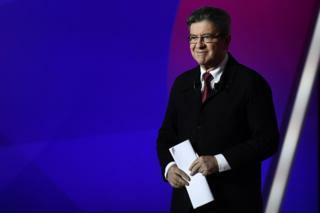 Both far-right leader Marine Le Pen and radical leftist Jean-Luc Mélenchon voiced sharp criticism of the EU in the early part of the programme. The TV encounter was then overshadowed by a deadly shooting in central Paris. Centrist Emmanuel Macron and centre-right François Fillon both paid tribute to the police targeted by a gunman. Mr Macron said "the first duty of a president was to protect" citizens, while Mr Fillon said he was cancelling all his campaigning events on Friday, the final day of the campaign. Ms Le Pen said she was doing likewise. Opinion polls suggest a tight race with some 30% of voters still undecided. It is turning out to be the most unpredictable election in generations in France and the programme is a last chance for all of them to speak to the nation, the BBC's Hugh Schofield reports from Paris. Ms Le Pen and Mr Macron are seen as frontrunners to progress to the second round in May. However, Mr Fillon of the centre-right Republican party and Mr Mélenchon are also in the frame. The candidates drew lots to establish the order of speakers, with Mr Mélenchon coming first. Each candidate was interviewed individually for 15 minutes. Ms Le Pen said she wanted to "give back to the French the keys of the house". As she delivered her line, she dangled a key before viewers. She called for withdrawal from the euro "to restore competitiveness". On terrorism, a major concern for France after attacks claimed by so-called Islamic State, she said "hate-preaching imams" and foreigners who are on a police security watch list should be expelled. Is Le Pen far right? When Mr Mélenchon was asked if France should leave the EU, he replied: "We change it or we leave it." He said he believed in an "independent France orientated towards peace". Asked about his controversial tax plans, he said: "We are actually going to tax incomes above 400,000 euros [£335,000; $429,000] a year at 90%". Benoît Hamon, the candidate of the ruling Socialist party who has plummeted to fifth place in the polls, attacked austerity, saying the European project was under threat. "I am the only candidate who will improve employees' pay slips," he said.